Fifty years ago, a group of Italian scholars gathered to discuss a problem: how to preserve traditional Italian cooking. They formed the Italian Academy of Cuisine to document classic recipes from every region. The academy's more than seven thousand associates spread out to villages everywhere, interviewing grandmothers and farmers at their stoves, transcribing their recipes--many of which had never been documented before. This is the culmination of that research, an astounding feat--2,000 recipes that represent the patrimony of Italian country cooking. Each recipe is labeled with its region of origin, and it's not just the ingredients but also the techniques that change with the geography. Sprinkled throughout are historical recipes that provide fascinating views into the folk culture of the past. There are no fancy flourishes here, and no shortcuts; this is true salt-of-the-earth cooking. The book is an excellent everyday source for easily achievable recipes, with such simple dishes as White Bean and Escarole Soup, Polenta with Tomato Sauce, and Chicken with Lemon and Capers. For ease of use there are four different indexes. 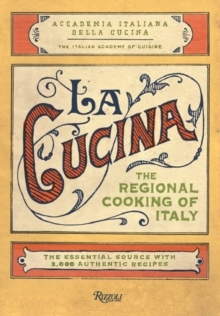 La Cucina is an essential reference for every cook's library.